Photo by Jim Murrain of I. nelsoniis growing in Kansas City garden..
Iris nelsonii is the most recently named Louisiana iris species, by Randolph in 1966. 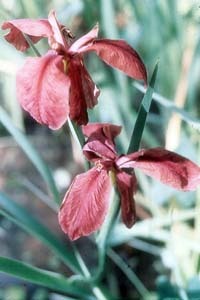 It was a sensation among Louisiana iris enthusiasts after it was "discovered" around 1938 by W. B. MacMillan. Apparently restricted to a small area Southeast of Abbeville, Louisiana, these plant were commonly called the "Abbeville Reds," or occasionally "Super Fulvas." 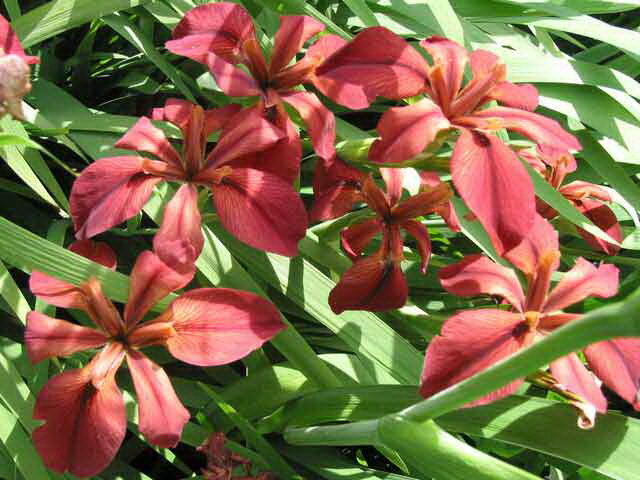 Because of their size and color, they were used extensively in early hybridizing. A few yellow forms were also found in the relatively small area of its range. The comparison to I. fulva was due to their color, and the superlative "super" reflected their size. 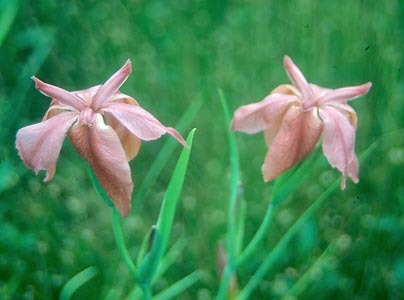 In their native swamp habitat, they grow considerably taller and have larger flowers than Iris fulva, although they resemble fulva in color. Unlike fulva, however -- and much more like I. giganticaerulea -- the Abbeville reds were found in shallow water in cypress swamps. Fulva is more typically an inhabitant of wet sloughs and roadside ditches; wet areas to be sure, but not in the swamp per se. Research has determined that I. nelsonii is a species of hybrid origin, with traces of fulva, giganticaerulea and brevicaulis in its background. It is presumed that the I. nelsonii environment was relatively isolated and, after unknown years of inbreeding, the population stabilized to create the species. Whatever I. nelsonii's origins, it was a fascinating find and was exceedingly important in developing the modern cultivars of Louisiana iris available today. For additional information on I. nelsonii, click these links. The Friends of Palmeto Island State Park has a nice page on I. nelsonii. The Park is located near the swamp that is the habitat of I. nelsonii, and in cooperation with the Department of Wildlife and Fisheries, the Park has introduced the species into the Park. Since the native stands of nelsonii are on private property and are considered endangered, the planting at Palmeto Island State Park is a major conservation effort. 1958 Charles Arny article "The Importance of the Abbevilles"
Especially see the links to Benny Trahan's articles back on the main Species page.